One of the benefits of being a PPC Marketer is the opportunity to constantly educate ourselves with a clients products or services that they are trying to advertise. Maybe after a few beers it might be compared to an Actor, who in getting ready for a new role, needs to be trained in Finance for 10 weeks so that they can understand what the hell they are saying. Joking aside, putting more investment into the clients business can definitely provide an “edge”. Let’s Face the facts. When a company hires a PPC Agency or “In-House” marketer, they expect some level of “Interest” into their business to help drive success. It is this expectation that whomever they hire, they want them to be as passionate as they are. However, once reality sets in, that is not such an easy task. This is especially true for PPC agencies that simply do not have the bandwidth to be that intimate with the client. 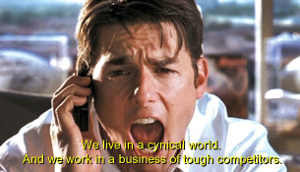 This conundrum kinda reminds me of the movie Jerry McGuire where in his mission statement, it mentions. “Personal Relationship, Less Clients, more attention, etc” Now of course, even though we are not Sports Agents, it does resonate on the effectiveness of PPC Strategies, successes and relationships. The most intuitive questions and strategy shifts that makes the most difference happen during the first couple months of the relationship. If you have a scheduled weekly or monthly call, always have a handful of questions to keep the client’s confidence in you that you are just not the same old PPC Agency. The client would like to here new ideas or other search or social media related trends that you are seeing perhaps with another client. There is nothing more important that open communication on hat is happening (good or bad), what is being done about it and what is next on the optimization, expansion or testing pipeline. Clients are always adding new products & services, altering content to their websites, and the PPC marketer needs to be on top of these updates if they want to constantly “move the needle”. In terms of Text ad Copy, the best content will be hidden in the existing content of the website, which would also compliment Quality Score, Relevancy and continuation from “before the click” to “after the click”. Writing Text Ads is more than just (25) characters for the Title and (35) characters for the descriptions and just filling whatever you can to fill in those areas. It’s about taking what is found on the website and applying marketing-centric messages that not only get the attention of the user, but also compliment what the advertiser is actually offering. Whether in conversation or direct questioning, finding out other ways that people label their services or products are an easy way to drive increased conversions and lowered acquisition costs. What I mean is, PPC Marketers usually rely on Keyword Research Tools to find the terms that people search for to find their products or services. However, there are times where the Keyword Tool does not go deep enough and the best keyword tool is the client’s business interaction with their “offline” efforts. This can also be found within the websites “internal search results”. The main point here is simply ask the client if there are other ways to say the same thing. The best thing a PPC Marketer can do is to honestly care about the client’s business and start learning everything you can about their business. It’s much more complex than driving specific keywords to their site. I also think that taking on a new client requires the PPC Marketer to “on occasion” impress the client with their knowledge of their business. PPC is becoming much more than keywords, it’s evolving into a multi-faceted strategy where finding the searches through keywords, visual Ads, mobile networks and social networking. So the more you know about the client, the better your chances are for leveraging the clients performance.